I was expecting a great book from this well-respected chef, Will Torrent. I wasn’t expecting the volume to have that overwhelming feel-good factor. That comes from a reminder of traditional sweet treats in the recipes, bringing comforting memories. And contemporary innovations bringing the realisation of ‘I can do that’ dusted with a smug ‘won’t the mother-in-law be impressed’. Thats Afternoon Tea at Home! Will has written a book that will be inspiring for both the enthusiastic novice and the experienced home baker. Some of the recipes might seem daunting but read them through and realise that they are not over-taxing and really just a combination of smaller recipes that can be executed individually and then constructed into the finished impressive article. Afternoon tea is a flexible light meal. It can be a cottagey affair with old-fashioned baked goods. These days it might be a smart event for the flowery dress and Ascot hat brigade. And then there are those fun spreads to celebrate a birthday. Will covers it all with suggestions for both sweet and savoury items and every type of occasion: tea menus for blokes, mums and dads, brides and even breakfast tea are all here. A classic tea has a formula. There will likely be a 3-tier stand with savouries on the bottom plate and that’s where one starts. Then the middle level probably contains scones to be served with fixin’s of jam and cream. The final selection will have grabbed your attention as soon as the stand arrived. That’s where the small cakes and fancies rest, like confectionery gems. Will has recipes to fill each of these plates. My picks of the book are numerous. Roast Beef Sandwiches are a must-try. Yes, slices of beef for sure, but a unique onion and garlic spread elevates this sarnie to a masterpiece. Another stunning savoury is the Chicken Liver Parfait with Thyme and Onion Confit and fluted brioche. It’s a metaphoric mouthful but break it down into its constituent parts and you have a rather versatile set. The parfait would be a spread for toast, the confit would work as a garnish for roast meats, and the brioche is a classic sweet bread with many uses. Scones are usually sweet and Will offers those, but his Triple Cheese Scones with Whipped Mustard Butter have my name on them. Other tangy nibbles include Olive and Anchovy Whirls. Will is a realist so he suggests you use good quality shop-bought puff pastry because he knows you’d do that anyway, and this recipe could not be simpler. Eccles Cakes are quintessentially English and show our traditional use of dried fruit. Will adds the rich and sweet sherry Pedro Ximénez in which to soak the currants and it makes a delightful difference. Keeping with the Spanish theme he serves the Eccles Cakes with Manchego cheese. If I had to choose just one recipe, just one tempting morsel, only a single remarkable creation, then it would be Mince Pie Brownies. It’s a beautiful pile of three layers and each with its own distinct yet complementary character. This would be on my top tier of the Christmas tea stand, but I’d have this as a festive dessert and a lighter alternative to Christmas pudding (which I loathe with a passion known to few). It’s Mince Pie Brownies for me in future, to finish Christmas dinner. 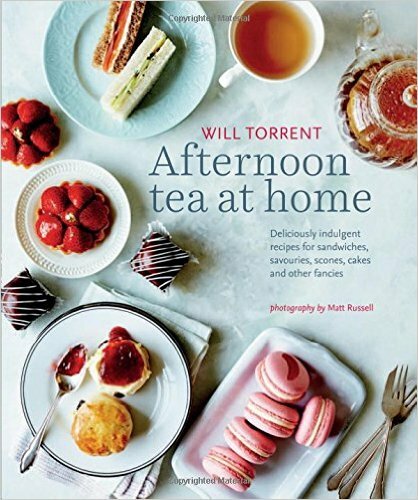 I am an unashamed supporter of the author of Afternoon Tea at Home. Will Torrent is evidently a talented baker and maker of scrumptious desserts but he is also a chap with a warm and engaging personality. This book presents a paper version of Will: it’s charming, reflects great skill but above all, it’s encouraging. If Afternoon Tea at Home doesn’t entice you into the kitchen then sell the kitchen!